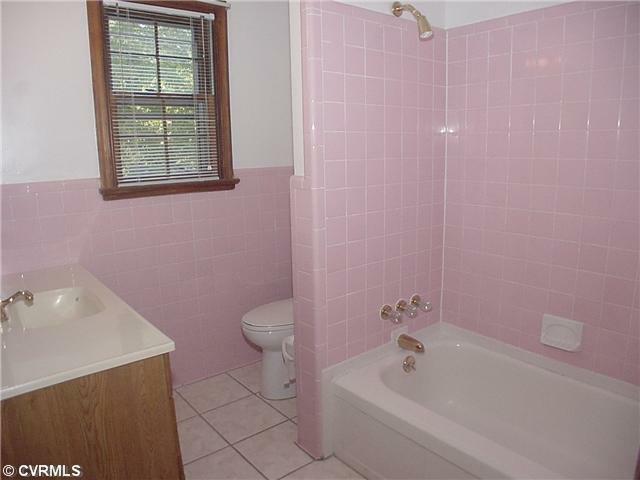 What do you do with a pink bathroom? This vintage stool which I had planned to paint matches the door frame and windowsill perfectly. It escapes painting for now. 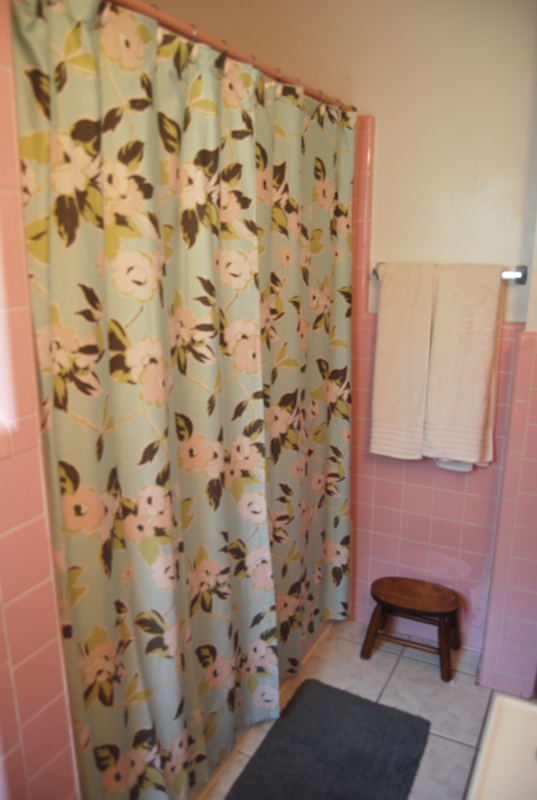 This shower curtain is the main color inspiration for the room, pink, aqua, grey and green. 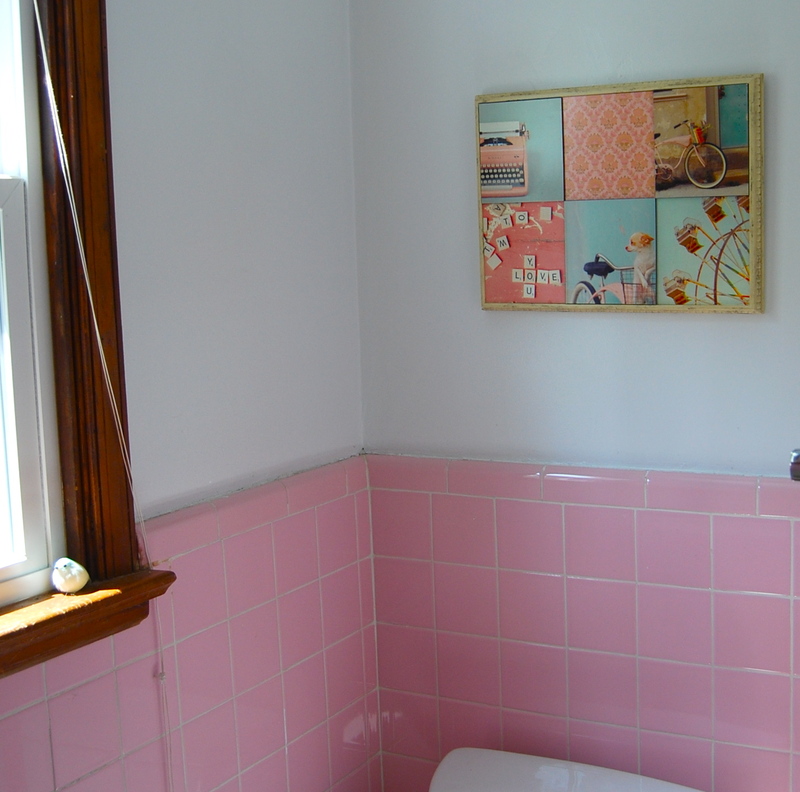 Another shot of my Target art… custom cropped to include more window bird and less toilet. I’m not at all done. (I’ve only lived in this house for a week!) I’m obsessed with my bathroom. And I have big plans for the vanity… updated pictures to come! Thanks so much for checking it out. I can’t wait to share the progress with you! Maybe if you chose a nice contrasting color to paint the non-tile parts of the wall, it would help to tone down the pink some. One of the bathrooms in my parents house is grey and pink (granted, the tile is grey and the bathtub is more a dusty-rose-ish color) so I definitely support that combination. Honestly, the more I see the pink, the more I love it! I thought about grey for the walls, (which I think is a lovely combo) and white for the trim, but for now I think I’m going to keep the white because I plan on doing something really eye catching for the vanity. I am on the fence about the stark white, I actually like that it makes the pink pop, but part of me isn’t so sure about pure white. – A really neutral grey might be a good move. I like the pink. I am with you about changing the vanity though. You deserve a nice big beautiful mirror. Thank you!! I love the pink! 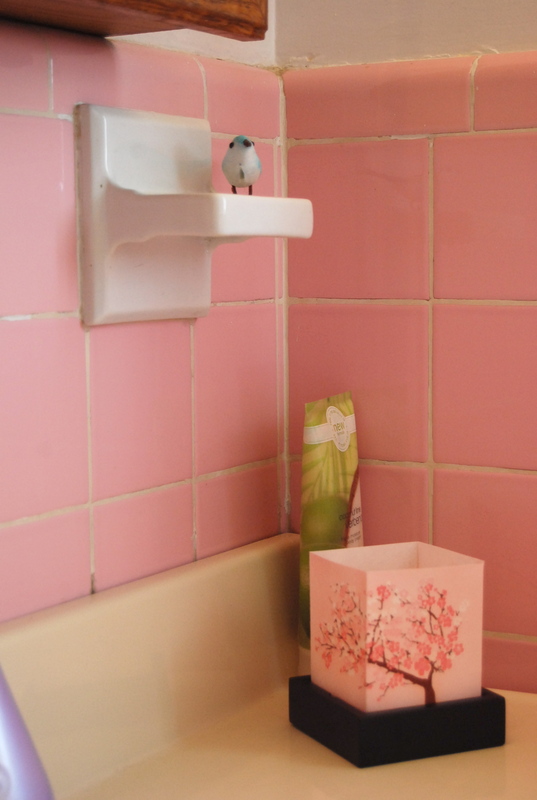 I have a temporary fix for the vanity in the works till we put in a new sink (and show off more pink tile behind it!) and eventually a new mirror too. 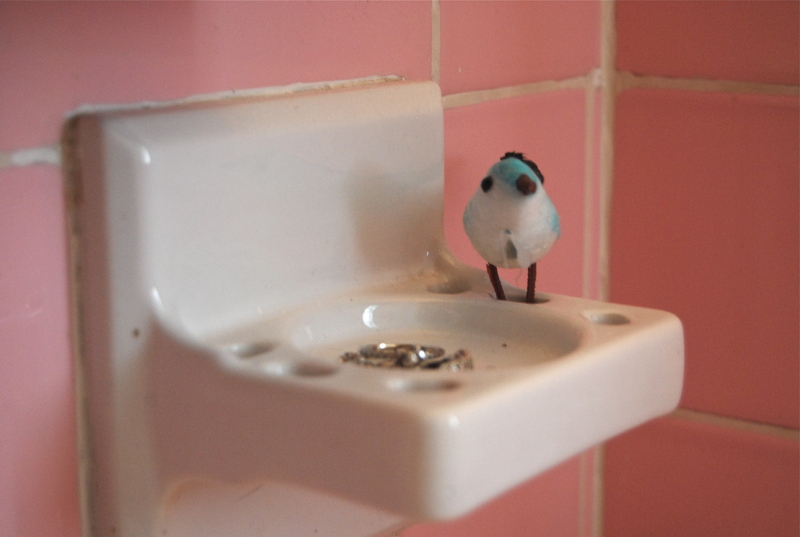 LOVE your soap dish bird! It’s so funny ’cause it’s so not “me” but I LOVE that little bird… I mess with him almost every morning. Just a little thing that makes me so happy. I might end up going with more of a bird-theme as far as accessories in there. On my computer your shower curtain read pink and brown and it looked good to me. Maybe you could go with a tan for your walls. 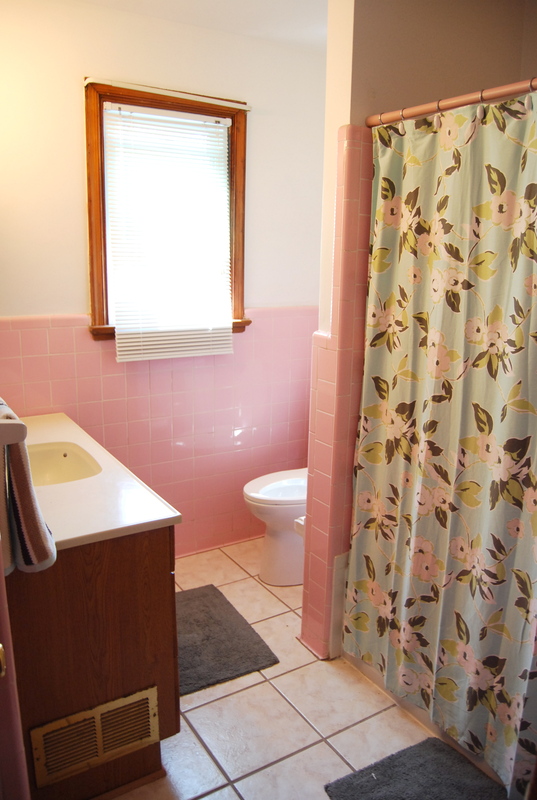 It would complement the wood trim while not competing with the pink. Tan would look really nice with the pink! Not really on subject, but kind of: when we got our first house, my husbands first idea was to get rid of the claw foot bath tub. I asked him if he was crazy! I guess he figured it would have been a hassle anyway, and I luxuriated in that tub for years. Wish I had one now! OOOH! I would love a claw foot bath! Your husband is in fact crazy for considering getting rid of it!! !